Samsung Galaxy Tab 10.1 available tomorrow | Android Blast! Samsung has officially announced the Galaxy Tab 10.1 will be available tomorrow. 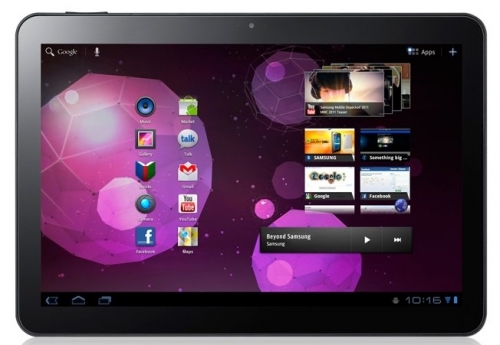 The Galaxy Tab 10.1 runs Android 3.1 Honeycomb on a 10.1-inch WXGA display. The Galaxy Tab 10.1 uses a 7,000 mAh battery that boasts up to 9 hours of continuous usage per charge. That's in the neighborhood of the iPad's battery life. Samsung announced the upcoming retail availability of the Galaxy Tab� 10.1, starting June 8. The WiFi-enabled tablet measures at just 8.6 millimeters slim, making it the thinnest mobile tablet currently available in the world. The 32GB version of the Galaxy Tab 10.1 WiFi edition will be available for $599, while the 16GB version of the device will be available for $499. A limited quantity of the Samsung Galaxy Tab 10.1 WiFi edition will be available for purchase exclusively at the Best Buy Union Square store in New York City on June 8. Best Buy customers may also pre-order the Galaxy Tab 10.1 online or in-store beginning that day. The Galaxy Tab 10.1 is powered by Android� 3.1, Honeycomb offering faster and smoother transitions between different applications, more intuitive navigation to and from home screens and broader support of USB accessories, external keyboards, joysticks and gamepads. The Galaxy Tab 10.1 is the thinnest mobile tablet currently available in the world, measuring in at an ultra-slim 8.6 millimeters. The Galaxy Tab 10.1 also boasts an incredibly light weight of just 1.25 pounds (565 grams) for outstanding mobility and comfort in the user�s hands. The Galaxy Tab 10.1 is designed with a brilliant 10.1-inch HD touchscreen display with WXGA 1280 x 800 resolution delivering vibrant colors and crisp clarity. This expansive screen is centered inside a narrow bezel to enhance the wide viewing angle.